On Friday, September 4, the ODFW Commissioners will be voting on a large package of angling rule changes created to “simplify” the Oregon fishing regulations. One of the rule changes calls for opening up kill on redband trout in the lower Deschutes River. Presently, there is a “slot limit” that only allows the take of 2 redband trout between 10 and 13 inches of length per day. 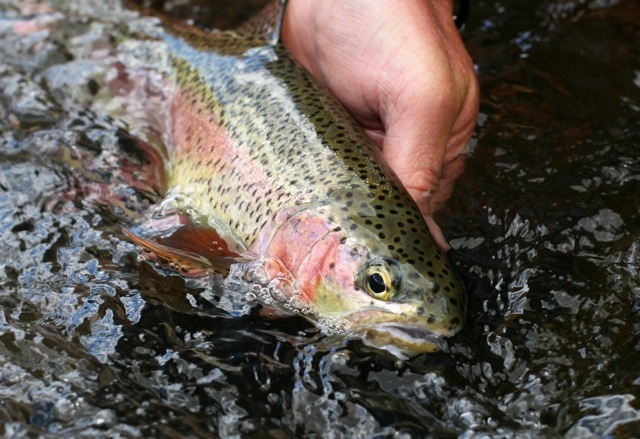 The new rule would allow the taking of any 2 redband trout over 8 inches per day. Our position at the DRA is that if the Commission wishes to simplify the angling rules, the easiest thing would be to do away with any kill of redband trout on the lower Deschutes by making it a catch and release fishery with the required use of barbless hooks. Now that would be simple! Easy to understand, no measuring of fish would be necessary, and it would be easily enforceable. Anything short of this deserves a deferral on decision-making to allow the public to provide input on rule changes. We are hoping that the Commission will receive at least 1,000 emails from those of us who love the lower Deschutes River. Everyone who reads this needs to send an email. Help us meet a goal of 1000 emails by sending one today! Do it now! Redband trout, lower Deschutes River. Photo by Brian O’Keefe. Why Does ODFW Want to Open Up Kill of Redband Trout? Part of the justification for proposing opening up kill on fish over 8 inches on the lower river is that the river “already has a catch and release culture.” So the question would be why does ODFW want to use that as a justification for opening up kill? This makes no sense. As a matter of fact, this change could very well change the catch and release “culture” of the lower river by inviting in a harvest mentality, which would have the opposite effect suggested as a consequence of the rule change. This could also have a long-term impact on the economy that has grown around the catch and release “culture” of the lower river. We’ve done some first order approximations of the value of the lower river fishery (and will be commissioning a formal economics study in the near future). We’ve determined that the lower Deschutes fishery is worth roughly $135 million per year (using American Sportfishing Association guidelines). Trout angling is only a part of that total dollar amount. But why does ODFW want to punish the businesses dependent upon the current angling practices on the lower river? No one has proposed a biological benefit of the new rule opening up kill for redband trout over 8 inches that is based on data. As a matter of fact, ODFW recently completed a study in which they claim the lower river redband trout population is healthy. So why do they want to change trout harvest management? It would appear that the proposed change is a heavy-handed measure without biological benefit. So why? It’s not just the Deschutes that is potentially impacted by the current rule change proposals. The new “simplified” rules would have statewide impacts on many rivers and lakes. Some of the rule changes would be positive, some have negative consequences for established fisheries, and some are frankly meaningless. Opening high lakes prior to the opening of the roads to access them each year would have little or no benefit to many anglers, or to the fish. Certainly the angling rules need some simplification. The language used in many of the rules is confusing and hard to understand. Some improvements are needed. Clearer writing would fix many of the problems. The rule changes have apparently been in the works for months. There has been little or no effective notification of the public of the nature of this rule making process. The public meeting wherein the rules will be adopted is being held the Friday of Labor Day weekend in Seaside. There is probably no more difficult location to travel to on that date than Seaside. In case you are interested in going, there are presently no hotel/motel rooms and no campsites available in the Seaside area due to the holiday. Anyone wishing to testify on the proposed rules will be allowed three minutes to testify. No one can testify on all of the proposed rule changes in three minutes! If you try to find the proposed rule changes on ODFW’s website without the link provided above, good luck. You won’t find the proposed rule changes using Google or the ODFW website search engine. You have to dig to find them. Why are the proposed rule changes being posted in a way that makes them obscure and difficult to access? Why are they not being publicized via public media? Why hasn’t there been email notification of effected constituencies? We ask the Commission, please, defer voting on the present proposals until adequate opportunities have been created to obtain public input. The public deserves to be heard on these matters. Fishing the lower Deschutes River. Photo by Brian O’Keefe. 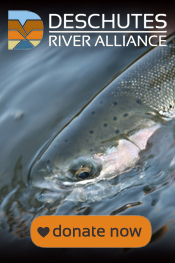 Click here to sign up for the Deschutes River Alliance newsletter! In the words of DRA board member John Hazel, “It’s been a rugged summer.” He’s right. Drought, fire, smoke, warm water temperatures, fish die-offs, and fishing closures have all plagued the lower Deschutes River this year. Now we have a new problem. As if the lower Deschutes hasn’t had enough problems already. 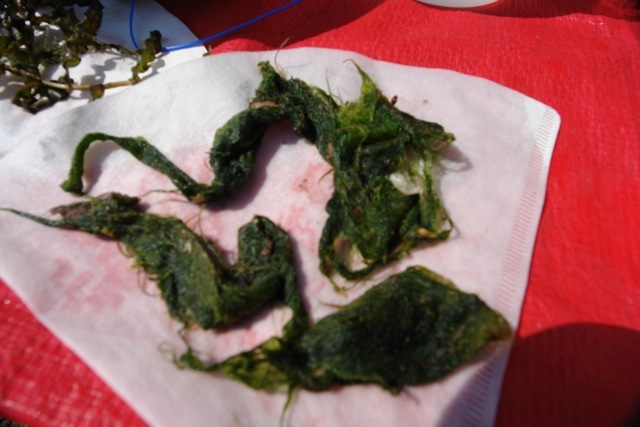 Starting two weeks ago we started receiving emails and phone calls about a free-floating, green filamentous algae being present in the river. It was draping itself in clumps over flies, knots in fishing lines, lures, side-planers and anchor lines on boats. Shortly after that we started hearing from individuals with pumps in the river for domestic and irrigation withdrawals. The algae was clogging the screens on their pumps. Next we heard that the water pump at the fish counting station at Sherars Falls was suffering from the same problem with clogged screens. The impact to irrigation pumps has resulted in screens having to be cleaned several times a day. This puts very expensive pumps at risk of serious damage. The potential economic consequences of this are hard to estimate, but it does have an impact. Anglers are already avoiding the lower Deschutes due to warm water, a slippery river bottom, lack of aquatic insect hatches and turbidity from White River. This impacts guides, outfitters and other businesses dependent upon the angling economy. For those with pumps in the river, the cost of a damaged pump, labor to clean screens, or an outright inability to irrigate would be damaging to their incomes. These incomes pay the tax dollars that support Wasco County and the Maupin School District. These stringy looking dark green algae have been presumptively identified as Cladophora, with possibly some Anabaena mixed in. Cladophora has been observed in the lower Deschutes River for a long time. But never in quantities like are being observed now. The peak time for growth of Cladophora is typically late spring and early summer, although it can undergo a growth spurt in fall as decomposing organic matter provides nutrients to stimulate its biological activity. Cladophora is widespread globally. Cladophora blooms in the Great Lakes are legendarily bad and have created major environmental problems including fish die-offs. This happens when the Cladophora dies and starts to decay, using up oxygen in the water and creating low oxygen conditions for fish and other aquatic organisms. 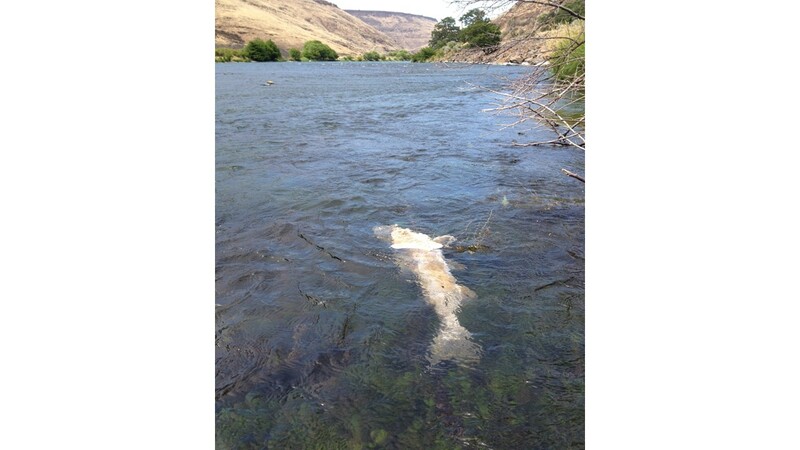 We are not likely to see fish die-offs due to Cladophora in the lower Deschutes as long as the flowing water in the river helps keep oxygen at adequate levels. The growth of Cladophora has probably reached its peak in the lower Deschutes River, as well as its maximum life expectancy. It is now detaching from the substrate in the river and floating off in the current for the last of its short life. Cladophora sample collected from the lower Deschutes River on August, 16, 2015. Photo by Greg McMillan. Why So Much Cladophora Now? Cladophora blooms like we are seeing in the lower Deschutes River are invariably the consequence of an increased nutrient load in the river. The nutrients are nitrogen and phosphorous. Warm water helps fuel the growth of Cladophora. This summer has been very warm, even downright hot at times. Temperature management at the Pelton-Round Butte Dam Complex has used large amounts of surface water to increase dam discharge water temperatures in accordance with the Without Project Temperature (WPT, and previously called Natural Thermal Potential) model utilized by the dam owner/operators (Portland General Electric and The Confederated Tribes of the Warm Springs Reservation). In a recent blog post we described how this model works and how it results in the harmful warming of the lower river during times of warmer air temperatures. During our fieldwork in Lake Billy Chinook this year, we’ve been seeking to determine how dam operations have altered the nutrient load in the lower Deschutes. We’ve found that of the three tributaries, the Crooked River has the highest nutrient load, while the Metolius River has the lowest. The Metolius, in our sampling, has had no detectable nitrogen based nutrients. The Metolius River enters the reservoir and then flows into the forebay of the dam at depths approaching 350 feet. The Crooked River enters the forebay at about 120 feet of depth (the Middle Deschutes enters the Crooked River Arm about ½ mile south of the forebay). The result is that the combined Crooked and Middle Deschutes River water sits on top of the Metolius River water during warm months. Once the lake cools in mid- to late fall, the lake begins to “turn over” or mix. 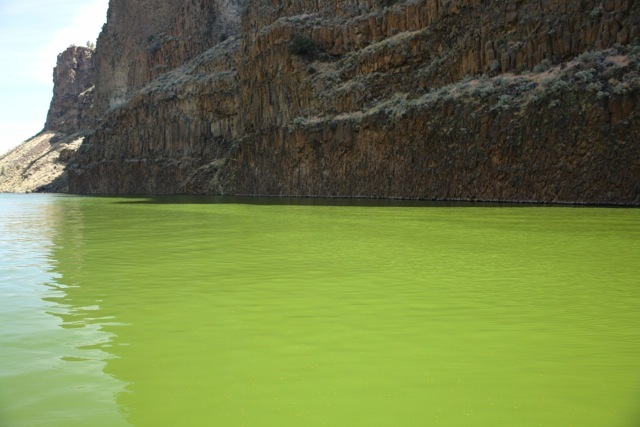 By mid-summer the algae in the reservoir have used much of the nutrients for their own growth, but through spring and early summer that nutrient laden water is discharged into the lower river. The result is more rapid algal growth. And not just with Cladophora, but also with the stalked diatoms we’ve been documenting in the lower river that have contributed to the decline of aquatic insects. Prior to the completion of the Surface Water Withdrawal Tower at Round Butte Dam in 2009, Metolius River water made up the bulk of the water drawn from the reservoir for power production. We didn’t have these problems in the lower river prior to operation of the SWW Tower. We are certain that these consequences of surface water withdrawal were not intended in the design and implementation of the Selective Water Withdrawal program that attempted to provide currents in the reservoir for juvenile fish migration. It has been demonstrated in cases of other Cladophora blooms that controlling nutrient load reduces or eliminates the problem. That can be done in this case. And should be done by reducing the amount of warm, nutrient-laden surface water being discharged into the lower Deschutes. 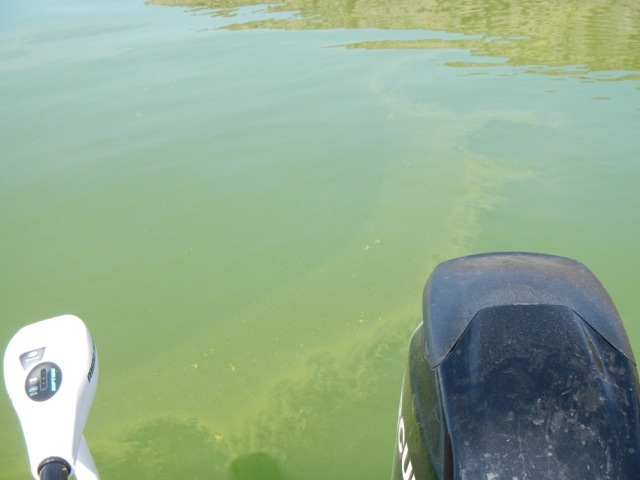 Nuisance algae problems have been increasing annually since the initiation of surface water withdrawal at Round Butte Dam. We need to develop the political will to push PGE to alter dam operations in a fashion that eliminates the nutrient loading of the lower Deschutes River. This is possible now with the adaptive management language in the dam operating license. We also need the Oregon Department of Environmental Quality to stop ignoring the ongoing violations of water quality standards in the lower Deschutes River. This will require in-depth water quality studies that could take years to get done. So it needs to start now. This is the long-term remedy to the algae problems in the lower Deschutes River. Lower Deschutes River. Photo by Robert Sheley. It’s been a rough summer. No one anticipated the fish die offs and warm water temperatures to the degree we experienced in June and July. Fortunately, we dodged the bullet with a second heat wave. It was of short duration, and then broken by cooler temperatures, cloud cover and some rain. 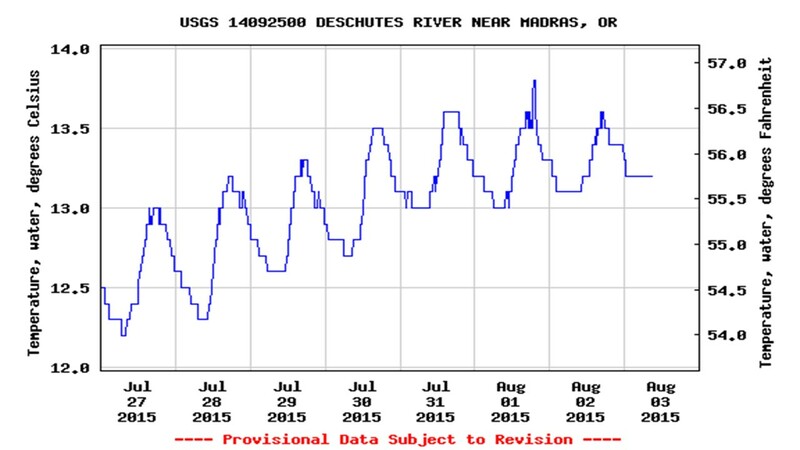 Water temperatures at Madras gage, July 27 – August 3, 2015. Source: USGS online. Water temperatures at Moody gage, July 27 – August 3, 2015. Source: USGS online. This PGE model uses the water temperatures of the tributaries (Metolius, Middle Deschutes and Crooked Rivers) entering Lake Billy Chinook, along with air temperature at Redmond airport, to derive the calculated target temperature (WPT) for dam discharge. The lower river, running for 100 miles below the dams, has a daily swing of nearly six degrees during the summer. The tributaries above Lake Billy Chinook have a similar swing in daily temperatures, varying by up to six degrees between morning and late afternoon temperatures. The discharge temperature at the dam complex only varies about 1 to 1 ½ degrees daily. The temperature discharged from the Reregulation Dam tailrace has a major influence on lower Deschutes River water temperatures. The temperature management model warms the lower Deschutes River in spring and summer, but cools it in the fall. Based on annual temperature curves, the spring/summer warming is much greater than the cooling in the fall. 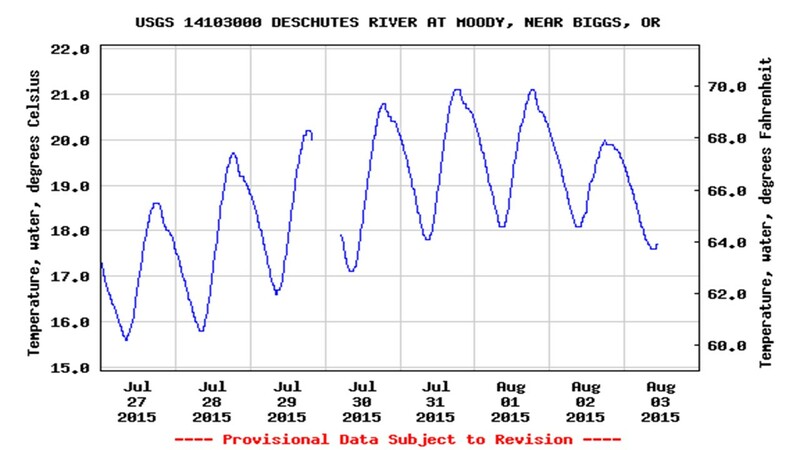 Therefore, the lower Deschutes is experiencing net warming during a year-long cycle. The temperature model for the dams increases temperature in the lower Deschutes when the lower river is already warm (at times too warm) in spring and summer. It should be noted that the stated goal of temperature management using the Selective Water Withdrawal Tower is to “eliminate the thermal presence” of the Pelton-Round Butte Complex. These observations made us curious. How can you manage water temperature with the goal that the dams would be thermally invisible, and yet not have the daily variances that mimic a natural river? In trying to figure this out, we also wondered what tributary water temperature is being used to calculate the Without Project Temperature goal? Is it the average or mean daily temperature? Is it the minimum daily temperature? This would be the most beneficial temperature for the biology of the river during heat waves. Or is it the maximum, warmest temperature of the day? We turned to the Portland General Electric/Confederated Tribes of Warm Springs Reservation annual water quality report that was recently submitted to the Federal Energy Regulatory Commission for the 2014-operating year to try to answer these questions. It turns out that the tributary temperature used to calculate the Without Project Temperature, and corresponding blend at the Selective Water Withdrawal Tower target for dam discharge, is based on a 7-day average of the peak (warmest or maximum) temperature of each day in the 7-day calculation. This means that the overnight cooling, and cooler temperatures that prevail throughout most of the day, are ignored. These cooler temperatures are the temperatures that fish and other organisms rely on to recover from the brief daily period of peak temperatures during summer heat waves, and especially in desert rivers. It should also be noted that the maximum temperature is only of short duration daily. But the model acts as if it is the only temperature of the day. 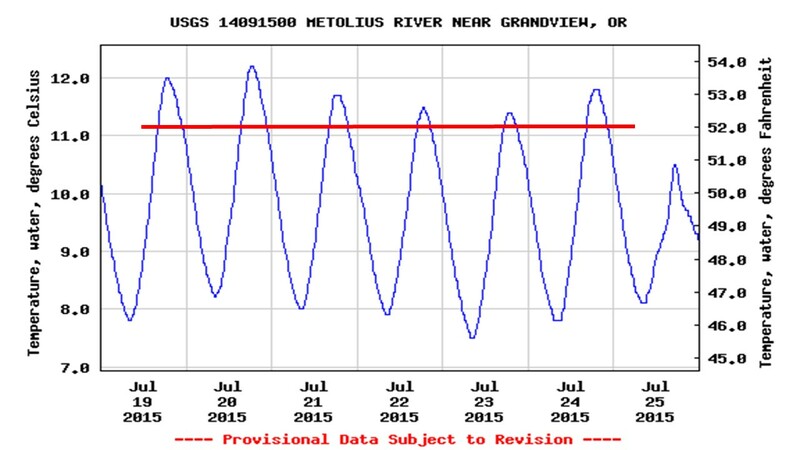 Metolius River water temperatures, Grandview gage, July 19 – July 25, 2015. Source: USGS online. The red line in the graph above indicates the temperatures from the tributaries above Lake Billy Chinook used in calculating Without Project Temperature (WPT). In other words, the dam operators are warming the river during spring and summer well beyond what would be its normal state without the dams because they are artificially managing discharge temperature based on the maximum temperature of the above reservoir tributaries, not the minimum or average daily temperature of the tributaries. Charles Huntington, working under contract to PGE, did the seminal work that was done on understanding water temperature behavior in the lower Deschutes. The work was completed and published in April of 1999. It became the foundation of how water temperature at the dams would be managed. In the published results of that study, the impact of temperature changes to the biology of the lower river was only minimally examined. The most discussion was in regard to changes in the timing of emergence of salmonid alevins from spawning gravel. The report concludes that juvenile emergence would happen sooner in warmer water conditions. No impact to the success rate of emergence is noted, or suggested, as a benefit of warmer temperatures. The question regarding what the impacts and effects on other biota (life forms) is asked, but never answered in the report. Impacts to resident fish species, aquatic insects, aquatic plant life and algae are not examined. 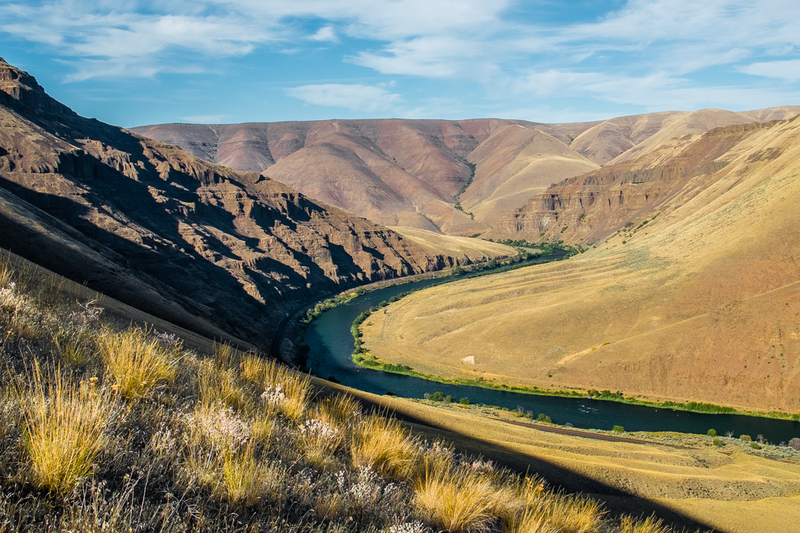 No mention is made in the report of the role the lower Deschutes plays as a thermal refuge for upstream migrating adult salmonids in the Columbia River when it reaches maximum daytime temperatures during the summer. No mention is made of what would happen if increasing temperatures, as a result of dam operations, in the lower river during spring and summer, reached the point of causing heat stress in fish. No defined threshold was set as a maximum river temperature that should be reached before overriding the “mathematical model” to interject human judgment and decision-making. What is discussed is the role dam discharge temperature plays in affecting temperatures downstream from the dams. In varying conditions, dam discharge temperature can affect lower river water temperatures as far down as the mouth. Yet the dam operators are only held responsible for the dam discharge temperature at the Reregulation Dam, not the impacts downstream. It’s time for a reexamination of how water temperature is managed in the lower Deschutes River. This reexamination should be a more holistic approach to the health of the river and its resident species. Thresholds should be set where protection of aquatic species is the primary goal for temperature management. The 2005 dam operating license allows for, and even mandates, adaptive management, meaning changes can be made when new information shows that current methods are flawed. This means PGE, the Tribes, and the agencies responsible for protecting the aquatic health of the river can act now to lower the temperature of water released from the dams. A victim of warm water temperatures. Dead spring Chinook salmon found in lower Deschutes River below Nena boat launch, July 10, 2015. Photo by Andrew Dutterer.